To simplify your project, many companies are integrating their outdoor living products, creating collections that are specifically designed to work together. Here are four ways you can take advantage of these bundled systems and create a beautiful and inviting space in your own backyard. 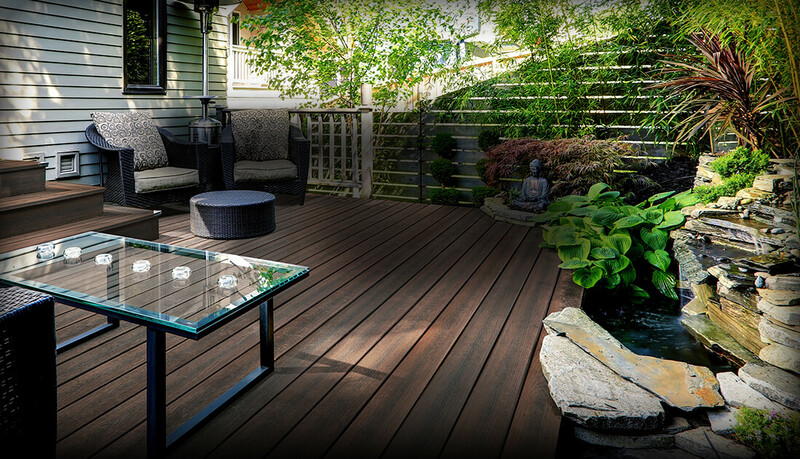 Where wood decking was once the only option, innovations in technology have allowed many advancements in the types of decking boards available. One of the fastest growing outdoor products is composite decking, which features boards made of recycled plastics and wood fibers. Such boards are eco-friendly and offer long-term durability. Some boards are even specially designed to mimic the look of high-end hardwoods, offering the luxurious finishes of these exotic wood species without the upkeep. Innovative brands, like MoistureShield, pair these high-end looks with proven performance protected by a transferable lifetime warranty, making it easy to relax on deck. Sometimes the most beautiful part of a deck is what you don’t see. To help blend interior and exterior spaces, using hidden fasteners can create an unblemished deck surface similar to wood flooring. Hidden fasteners fit into grooves on the sides of the deck boards, which keeps nails and screws out of sight. This innovative option eliminates unsightly screw heads, not only creating a more beautiful deck but also a safer one. Some manufacturers even back their deck clips with as much as a limited lifetime warranty against loose deck boards, which provides homeowners peace of mind on the quality of their fasteners. Lighting is one of the top two outdoor design elements that landscape architects say is popular this year, according to the American Society of Landscape Architects. Decking manufacturers have responded to this trend by expanding their decking collections to include lighting lines optimized for easy installation with their board and railing options. The new variety of lighting options, including recessed bullet lights, under rail strip lights, stair lights and post lights can seem overwhelming and difficult to install. With the emergence of energy-efficient LEDs, installation of these lights has become easier, and performance has improved, making design possibilities limitless. Some systems are even sold as plug-and-play to help eliminate the need for an electrician, which allows do-it-yourselfers and deck builders to more easily install the lights on their own. These lights not only look great, they also help streamline the product selection and installation process by ensuring lights that perform well with the manufacturer’s decking and railing. One of the quickest ways to enhance your outdoor living design is by adding a contemporary deck railing. New railing options are designed to enhance the overall look of your deck, reduce maintenance of your space and improve your views. To accomplish this, many decks are being built with mixed medium railings, such as cable infills or tempered glass panels. As these railing selections become more specialized, it’s important to educate yourself about product warranties and installation recommendations to be sure you get the right product for your needs. Among the many choices, aluminum railing systems can provide a modern look at a more affordable price and are available in many color options. These systems may also be available in easy-to-install kits and are typically designed to adapt to the mixed medium infills. They provide a wide range of sophisticated styles to complement the sleek, modern designs of composite decking and are available with longer warranties than other options like vinyl railing.